Product Details-Ingredients-Dimethyl sulfone, Potassium chloride, Starch, Sunflower oil, minerals, zinc chloride, Crude fiber(80%w/w),crude protein(0.08%w/w),sulphur(2.55% w/w),mositure(5%w-/w),Calcium, L-cartinine, Taurine. energy value-600Kcal-kg. Dosage-First 3 weeks-1 Tablet per 5 Kg Body weight. After 3 weeks-1Tablet per 10 Kg Body Weight. Use-perfect for hip dysplasia and other joints disease management.Suitable-Dogs,Quantity-100 tablet box. 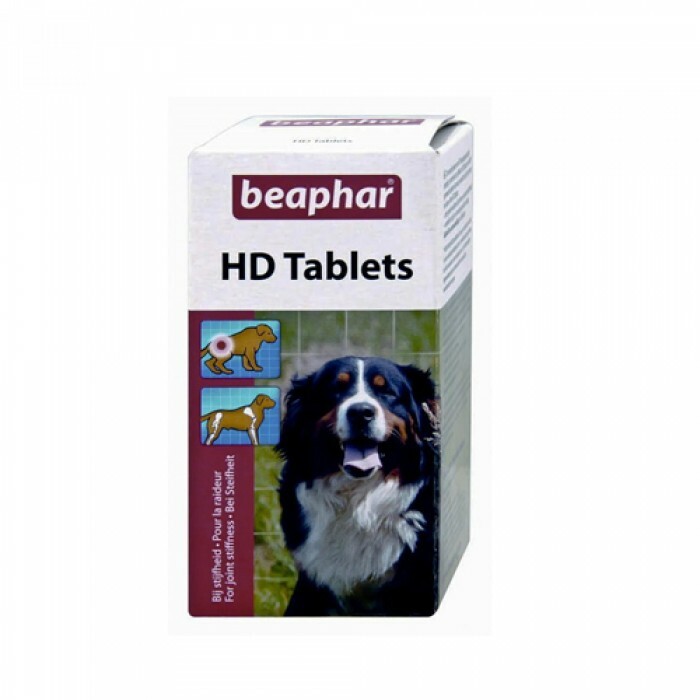 Product Information -Beaphar HD Tablets have been created to target the problem of hip dysplasia in dogs. Other joint-related problems will also be alleviated with the help of these Tablets. Synovial fluid lubricates the joints and promotes smooth movement. It also facilitates the supply of nutrients to the joints. HD Tablets stimulate the production of synovial fluid so that the dog experiences much reduced pain while standing up or walking. The joint health enhancing tablets also strengthens ligaments and supports the immune system. Beaphars HD is also useful against arthritis and muscle stiffness which usually occurs due to old age. It is not a painkiller,it works to alleviate the problem of mobility in dogs by making the joints supple. Directions of use-The tablet should be given to your dogs mouth as a whole, not as powder or broken pieces. Make sure your dog swallows it. Can also be given to cat-kitten likewise.